Mother's Day is early this year, Sunday May 8th! Are you ready? Mother's Day seems to be one of the hardest holidays to buy gifts for...doesn't it? Mom seems to have everything and she doesn't give you any ideas on what to buy for her. It becomes a guessing game, to really know what to buy. This is our most popular item, by far, for Mother's Day! Grown locally in the Skagit Valley, especially for you and your Mom. 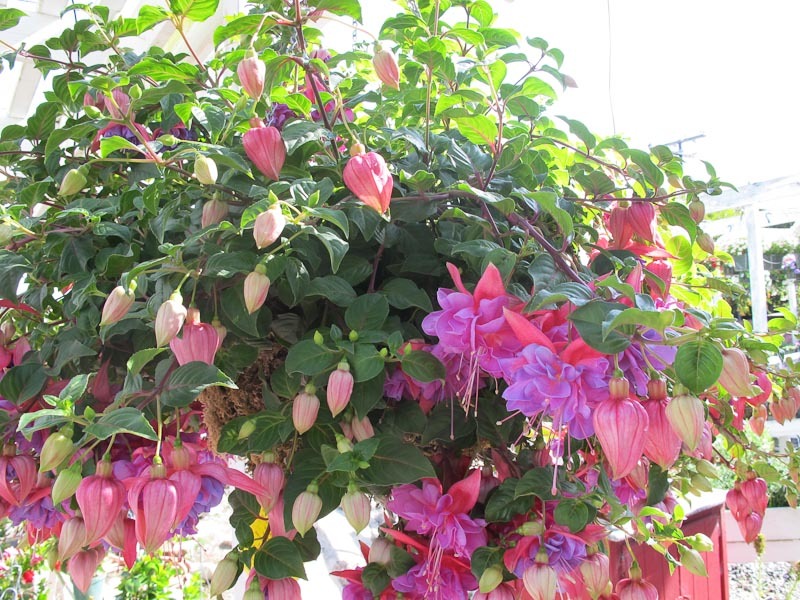 Fuchsias are perfect for a shady porch (part sun; if you water well). They are the perfect way to start off summer in the Pacific Northwest. Created by our designers Barbara and Nancy, we have a huge assortment of planted pots and terrariums, perfect for the porch or inside Mom's house. We have a great selection of benches, chairs and tables that are made locally as well as our colorful collection of Fermob French bistro sets. Complement that seating area by adding some matching dishes, glasses or small plates and containers to really pull together the entire look. Select your Mom's favorite color and she'll absolutely love it. We have gorgeous glazed and ceramic bird baths in bright, vibrant colors! The baths shown above are just to show the wildlife that Mom can enjoy, as we don't offer these specific selections, but have colors that could be matched with her seating area and outdoor dinnerware. If you haven't enjoyed the works of Circle Creek, Mistral and Australian Natural - You are REALLY missing out! These soaps and skin care are made by the purest, natural resources and it is evident in the end product. Full of rich, clean fragrance. An extra bonus is that Circle Creek is locally made, recently given an award by Martha Stewart for their stellar product mix. We have books galore that your Mom would love to learn about. Our book collection is not just limited to gardening topics, but we also stock books about cooking, canning and cocktails. I'd say... all topics Moms loves to talk and read about, wouldn't you? We are looking forward to having you visit us at Ravenna Gardens! Make sure to mention our newsletter and blog post for this month, if it inspired you to stop by. We are here to help and look forward to celebrating Mother's Day with you. Cheers!